December | 2013 | 50 Westerns From The 50s. 50s Westerns DVD News #140: The Best Of 2013. A blogger friend of mine did a year-end wrap-up of his favorite DVD releases of the year. I think a lot of my friend, and imitation being the sincerest form of flattery, I decided to steal his idea. Here’s my Top Five. Comment away! 5. 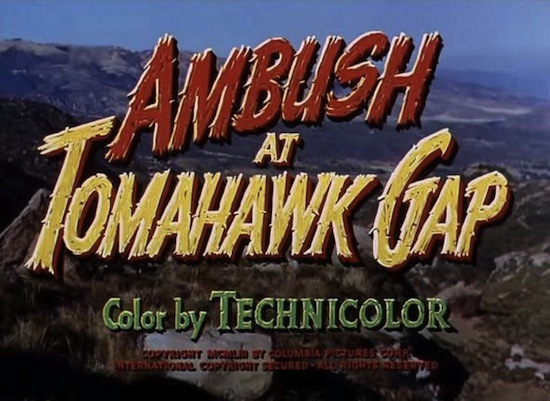 Ambush At Tomahawk Gap (1953, Columbia) The work of Fred F. Sears, a prolific director at Columbia, deserves a look, and this is a tough, tight little Western that nobody seems to remember. John Derek’s good and Ray Teal gets a sizable part. 4. 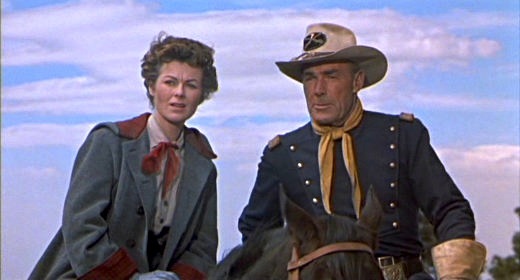 Randolph Scott Western Collection (Various, TCM/Sony) Four Columbia Scotts — Coroner Creek (1948), The Walking Hills (1949), The Doolins Of Oklahoma (1949) and 7th Cavalry (1956, above) — go a long way toward making all his 40s and 50s Westerns available on DVD. 3. Movies 4 You Western Classics (Various, Shout Factory) Four medium-budget 50s Westerns — Gun Belt (1953), The Lone Gun (1954), Gunsight Ridge (1957) and Ride Out For Revenge (1957) — for an amazing price. I’d love to have a hundred sets like this. 2. Shane (1953, Paramount) There was so much controversy about the aspect ratio — the studio-imposed 1.66 vs. the original 1.33 George Stevens shot it in — that we all forgot to talk about what a lovely Blu-ray was ultimately released (in 1.33). 1. Showdown At Boot Hill (1958, Olive Films) This is probably the worst movie on this list, but my favorite release. The very thought of a Regalscope Western presented widescreen and in high definition makes me very, very happy. Olive Films promises the best of the Regals, The Quiet Gun (1956), in 2014 — which you can expect to see on next year’s list. 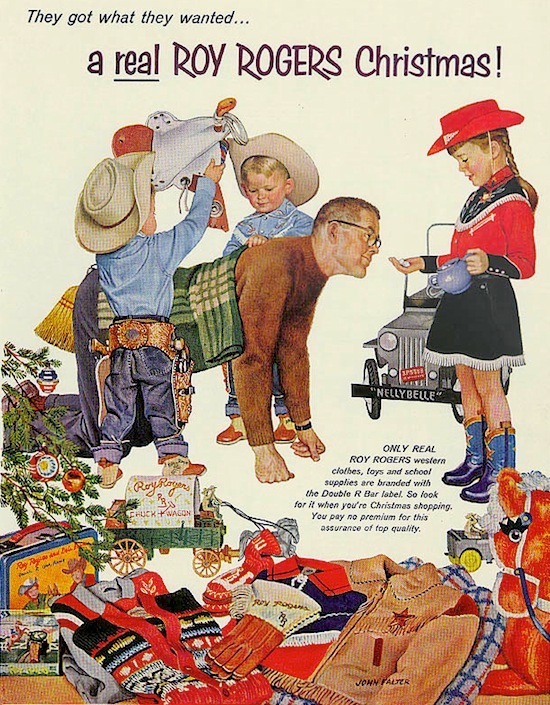 I’d like to wish you all a real Roy Rogers Christmas — which, judging from this 1957 ad, is a pretty great thing to have. And while I’m at it, here’s hoping you have a Western-filled 2014. 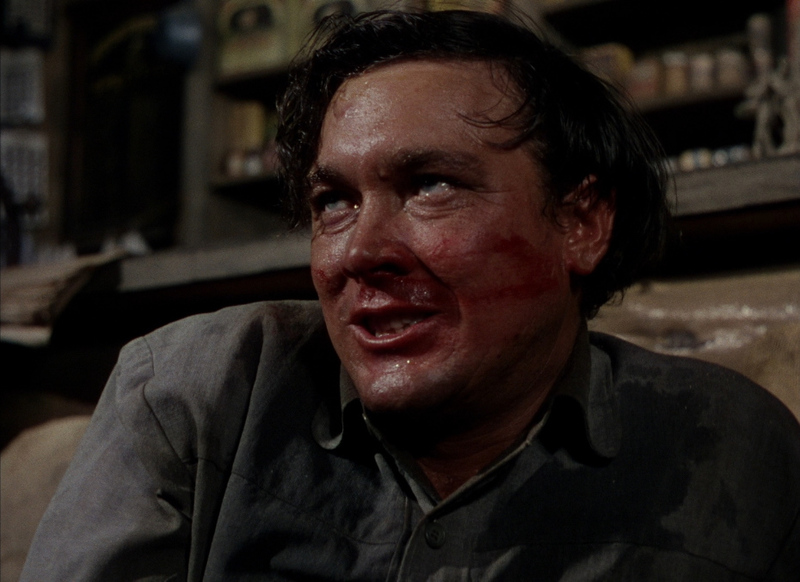 Character Actor Of The Day: Robert J. Wilke. It’s been a while since I did a Character Actor Of The Day, so I decided on a big one: Robert J. Wilke (May 18, 1914 – March 28, 1989). Wilke started out as a stuntman in the 30s, and was soon a very prolific bad guy in movies and eventually on TV. He has hundreds of credits, most in Westerns. 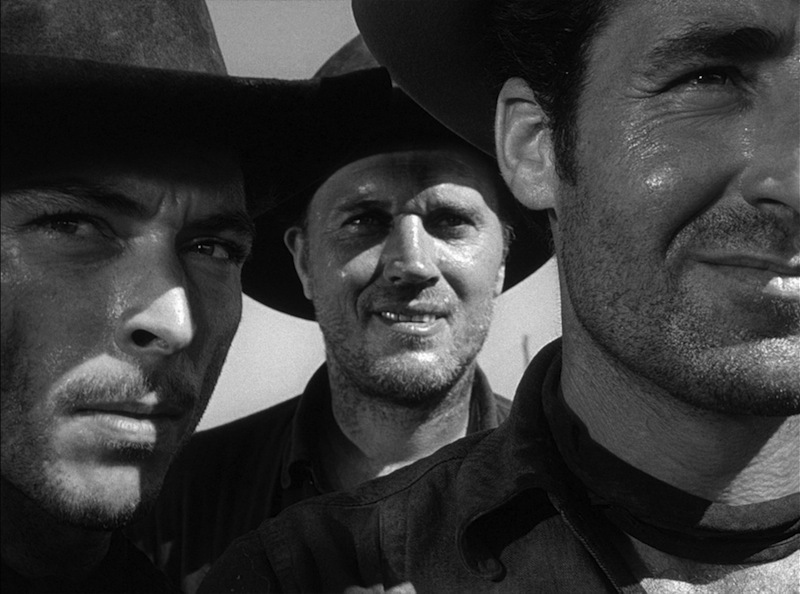 Here he is (center) with Lee Van Cleef and Sheb Wooley in High Noon (1952). He was appearing in many of the Tim Holt pictures from around the same time. Before breaking into the movies, he was a high diver at the 1933 Chicago World’s Fair. And he was known as one of the best celebrity golfers in Hollywood. Wonder if he and Randolph Scott set up a game during Badman’s Territory (1946)? 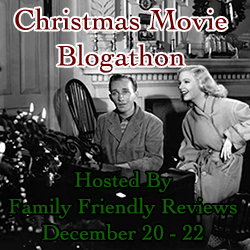 The Christmas Movie Blogathon: Trail Of Robin Hood (1950). This is my contribution to The Christmas Movie Blogathon. The post is an expansion of a previous piece I’ve been wanting to revisit. This blogathon gave me the chance. The old post has been largely removed, but I left something there to preserve the comments. Be sure to check out the other bloggers’ work. Some are folks who pass through here every so often. I’m particularly looking forward to the post on The Bishop’s Wife (1947), a personal favorite, and Ivan’s thoughts on The Lemon Drop Kid (1951), a very funny Bob Hope picture. 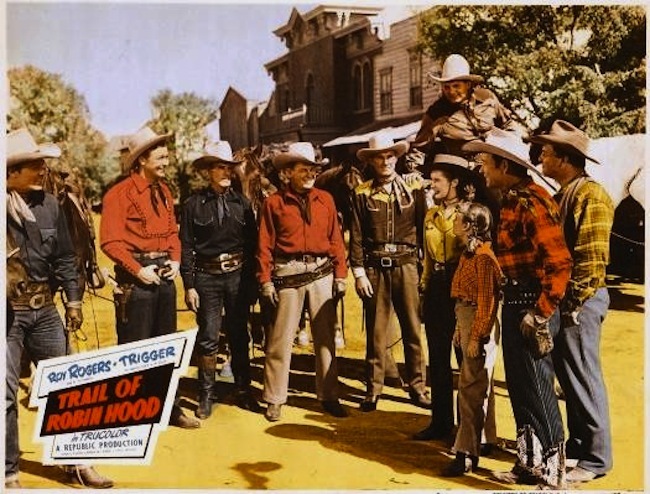 CAST: Roy Rogers, Trigger, Penny Edwards (Toby Aldridge), Gordon Jones (Splinters McGonigle), Rex Allen, Allan “Rocky”Lane, Monte Hale, William Farnum, Tom Tyler, Ray Corrigan, Kermit Maynard, Tom Keene, Jack Holt, Emory Parnell (J. Corwin Aldridge), Clifton Young (Mitch McCall), James Magill (Murtagh), Carol Nugent (Sis McGonigle), George Chesebro, Edward Cassidy (Sheriff Duffy). Of course, glitz, glamour and music rights come with a pretty hefty price tag, especially compared to two guys in western wear punching each other in the face. So with the smaller budgets came fewer songs — and more action. Good thing Roy’s director at the time was William Witney. 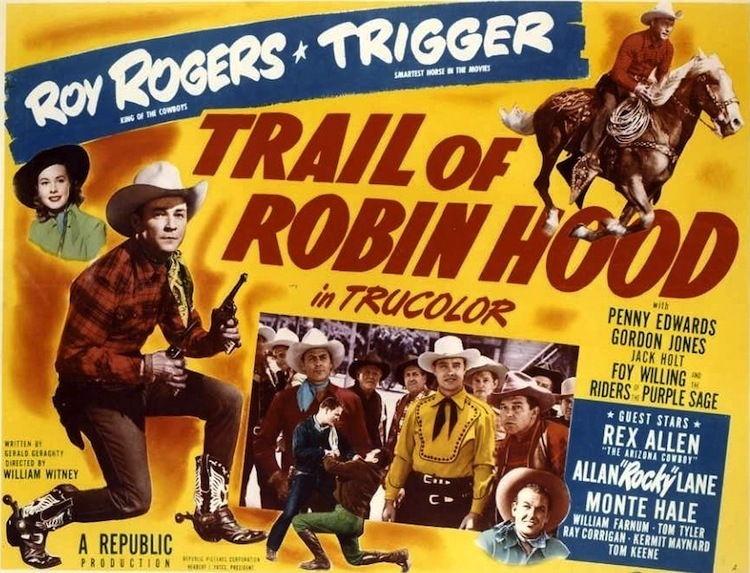 Such was the state of the Roy Rogers Movie when Trail Of Robin Hood (1950) went into production. It’s in Trucolor, Roy’s traded his Nudie suits for plaid shirts, and the action comes fast and furious. Oh, and in spite of its title, it’s a Christmas movie. Here, Roy works for the U.S. 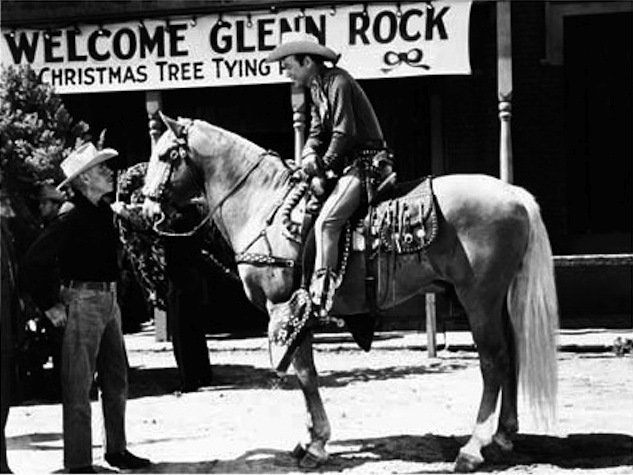 Soil Conservation Service and comes to the aid of cowboy star Jack Holt, who’s retired and growing Christmas trees — which he intends to sell at cost, so every kid can have one. A large Christmas tree conglomerate doesn’t like Holt’s business model and takes to stealing Holt’s trees, sabotaging his operation and threatening his workers. Naturally, Roy, Trigger and Bullet will have none of this. I don’t want to give too much away. Just know that the whole thing is actually goofier than it sounds — and that it’s full of fights, chases, fires and other mayhem. Along the way, Roy and the Riders Of The Purple Sage sing a couple Christmas songs (“Ev’ry Day Is Christmas Day In the West” is very good), there’s a young girl (Carol Nugent) with a pet turkey named Sir Galahad, and a number of Republic cowboy stars turn up to help save Holt’s farm. On hand are Allan ‘Rocky’ Lane, Monte Hale, William Farnum, Tom Tyler, Ray Corrigan, Kermit Maynard, Tom Keene, Rex Allen and George Chesebro. 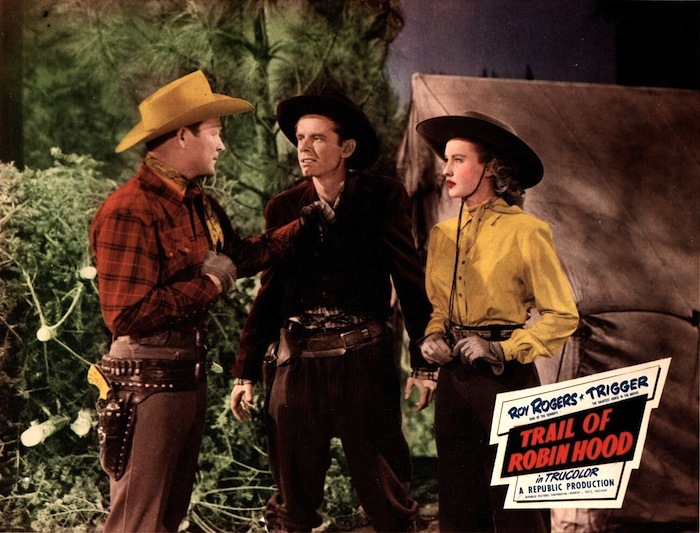 With Trail Of Robin Hood and the other late-period Rogers films (his last Republic picture came out in 1951), William Witney did more than just cut the music and stir in more violence — he turned up the pacing. He creates excitement, builds suspense and sets the pace through skillful editing. And the story is told visually whenever possible. The comedy (from Gordon Jones this time) and songs don’t get in the way or slow things down. Dale Evans, of course, was Mrs. Roy Rogers and his steady co-star. But she was on maternity leave. So Penny Edwards appears in Trail Of Robin Hood — in a part obviously written with Dale in mind. 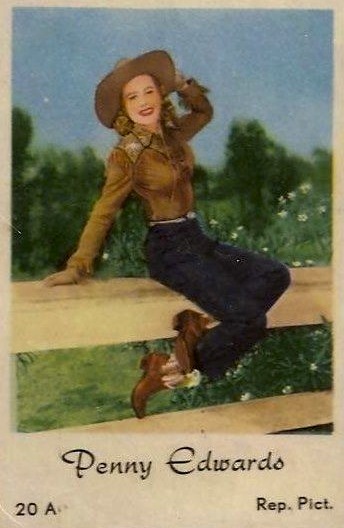 Penny transitioned from singer to actress, was under contract at Warner Brothers, made six films with Rogers in 1950-51, and left the picture business in 1954 to serve the Lord. She returned a few years later, appearing in lots of TV shows and commercials. 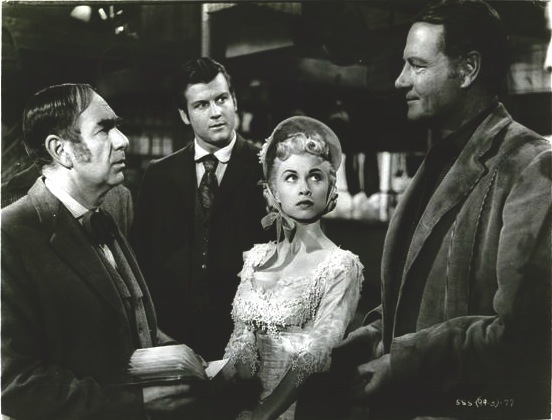 Gordon Jones plays Splinters McGonagle, the usual broad sidekick part you expect in a B Western. 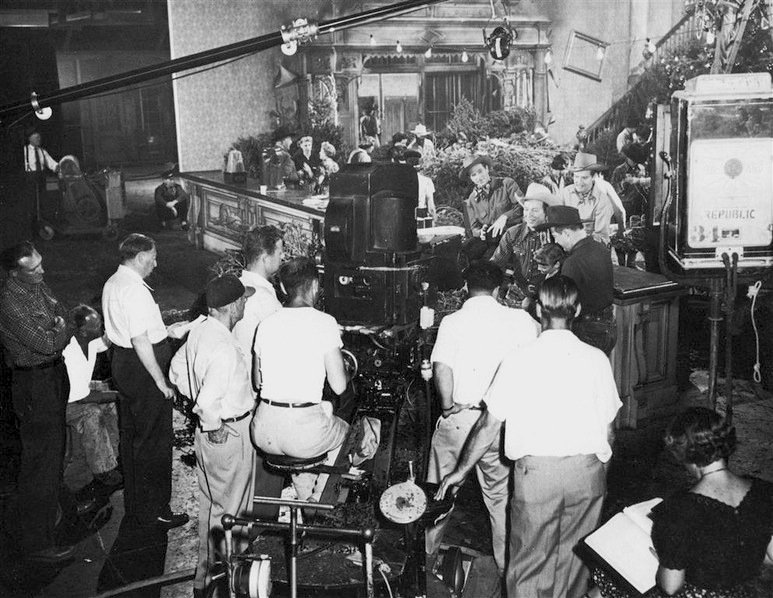 He was in six Rogers pictures, made a few other Republic films (including Woman They Almost Lynched) and would soon appear as Mike The Cop onThe Abbott & Costello Show. Carol Nugent is quite good. And of course, Jack Holt and all the guest stars are terrific. Another standout is the villain. Tall and thin, with a cleft chin and a voice deeper than you’d expect, Clifton Young makes a particularly nasty bad-guy, especially considering he works for a Christmas tree company. Young had been one of Our Gang, “Bonedust,” making the transition from silent to sound. Not long after Trail Of Robin Hood, he was killed in a hotel fire. Trail Of Robin Hood is wonderful, and it’s a shame it’s not better known as a Christmas movie (note the holiday engagement in Statesville, NC advertised up top). We can thank the title for that, probably selected more or less at random from Republic’s list, or file, of candidates. It was available uncut on VHS from Republic back in the day. But what you’ll find on DVD is cut by at least 10 minutes. Roy, and this great little movie, deserve a lot better than that. Sources: Quentin Tarantino from a 2000 NY Times piece; Cheryl Rogers-Barnett from a phone conversation with the author. The Old Corral At ClassicFlix: 3 Godfathers (1948). The folks at ClassicFlix let me write for them every once in a while. 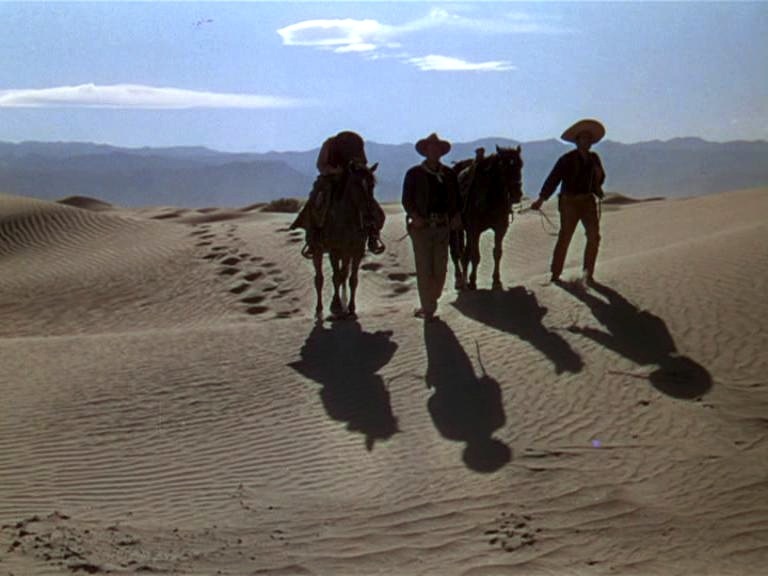 Here’s a piece on John Ford’s 3 Godfathers (1948), a pre-1950 Christmas Western that I love dearly, no matter how overly sentimental and sappy you might think it is. It’s also one of the most beautiful color movies ever made. Easy. No review this week, just a few odds and ends. 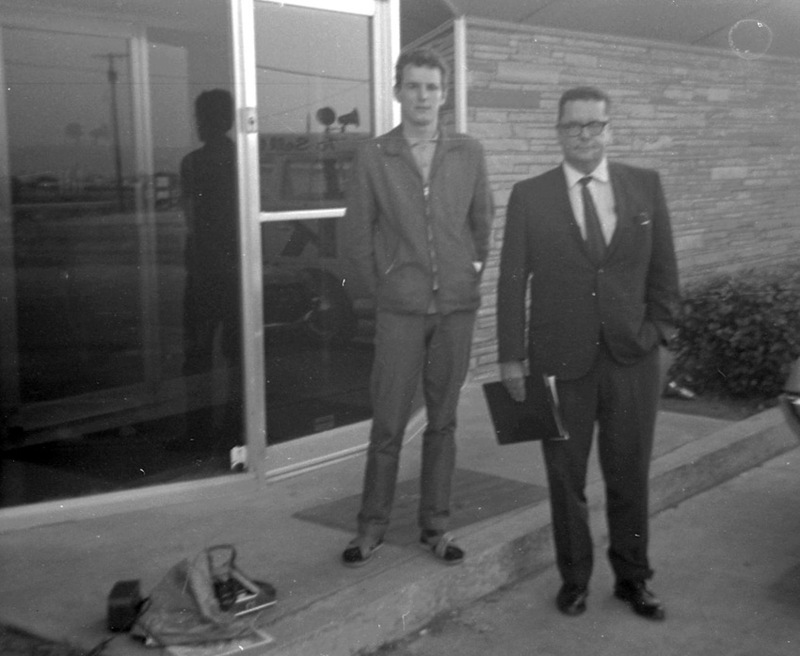 In a followup to the excellent interview he shared with us all, here’s photo of John Brooker with Tim on the front steps of Oklahoma TV station KLPR back in 1967. Thanks so much for sending this along, John. Laura commemorated Richard Martin’s birthday last week. Here’s hoping everyone put those Warner Archive Holt sets on their Christmas list. Tell Santa they’re on sale this week. Let’s remember my favorite actress, Marie Windsor, on her birthday. 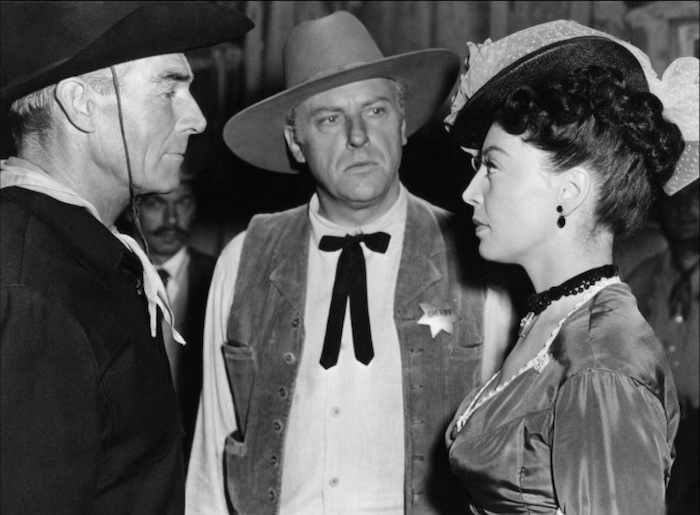 She’s seen here in The Bounty Hunter (1954) with Randolph Scott and Howard Petrie. I fought the urge to highlight yet another still from Hellfire (1949).